Outing celebrates 20th anniversary of ‘Supernatural’ album and 50th anniversary of Woodstock performance. 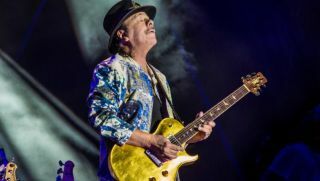 Santana have announced the "Supernatural Now" tour, a three-month, 29-date North American jaunt that will celebrate the 20th anniversary of his 1999 album Supernatural and the 50th anniversary of his legendary performance at Woodstock. The tour, which features special guests the Doobie Brothers on all dates, kicks off June 22 in Phoenix and wraps August 25 in Wantagh, NY. Tickets will go on sale to the general public beginning January 25 at LiveNation.com. The guitarist and his band will also perform new tracks from his new EP, In Search of Mona Lisa, as well as his upcoming Rick Rubin-produced full-length album. Check out the tour itinerary below, and for more information head over to Santana.com.